About The Author: Dr. Agwu Ukiwe Okali is the Founder-Chairman of The Okali Seminal Ideas Foundation for Africa (OSIFA), a non-profit Foundation dedicated to fostering and facilitating a more effective participation of Africa in the world of ideas, with the aim thereby to end the continent’s state of “ideas-dependency.” Born in Nigeria, where he attended the country’s elite King’s College, Lagos, Dr. Okali holds a Bachelor of Laws degree from the London School of Economics and Political Science, as well as Master of Laws and Doctor of Juridical Science degrees from Harvard Law School, where his doctoral thesis was supervised by the renowned jurist, Professor Lon L. Fuller. After a stint as a corporate lawyer in the U.S. private sector, Dr. Okali had a distinguished career at the United Nations, last serving as Registrar of the United Nations International Criminal Tribunal for Rwanda, with the rank of United Nations Assistant Secretary General. Among his achievements in service at the UN include pioneering a restitutive/restorative justice idea that mandates integrating assistance to victims into the conventional “retributive” approach of punishing the culprit in the administration of international criminal justice, which influenced key aspects of the set-up of the permanent International Criminal Court in 1998. Another of his noteworthy contributions was authoring a key strategy paper that assisted African leaders in the successful campaign to elect the first African UN Secretary-General in 1991, and ushered in the idea of “equitable rotation” of the post, influencing selection of the UN Secretary-General ever since. Dr. Okali, a long-standing member of the Connecticut (USA) State Bar, is married and has two children. Visit http://osifa.org/ for more information. 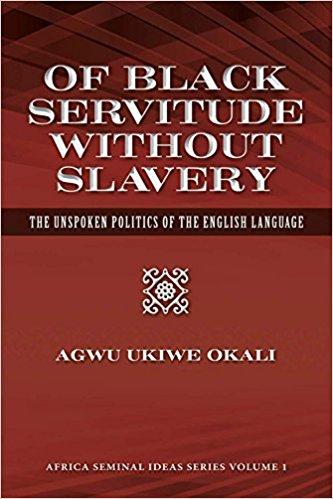 This entry was posted in Award, celebrity, honoree, Recognition and tagged African, African American, author, Dr. Agwu Ukiwe Okali, England, English, heritage, language, Of Black Servitude with out slavery, Okali Seminal Ideas Foundation for Africa, opportunity, Optimism, OSIFA, politics, Recognition, Today's Honoree, UK, unspoken, USA, writer. Bookmark the permalink.